The 25 year-old checks out local science museums while bringing her kids along on vacation. Attending a publicity event for baby formula milk powder in Hong Kong, mother-of-two Hannah Quinlivan (昆凌) shared about parenting. 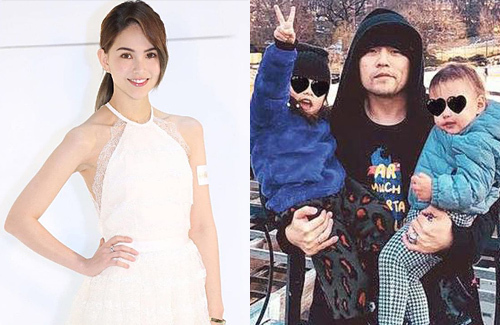 The 25-year-old actress, also the wife of Mandopop King Jay Chou (周杰倫), said that the couple would bring her two kids – a son and a daughter – along on trips to different countries when they have free time, and also explore local science museums in the hopes of inspiring their little ones’ potential. Earlier, she had gone on a vacation trip to Europe with husband Jay and her two kids. Having less couple time since the children’s arrival, they decided to enjoy a longer vacation, taking the chance to enroll their kids in short classes in the host countries. The actress said, “Before they turn four years old and enter preschool, we brought them along on travels and went horse riding when we visited France.” Hannah indulged in plenty of desserts during the trip, and was worried about putting on weight. Sharing about the personalities of their 3-year-old daughter and 1-year-old son, Hannah said, “The boy is more gentle while her elder sister is curious about everything. Her brother takes the lead from his sister, so I tell her to be a good role model.” While it is tough to bring up the children, Hannah treasures the time spent and is happy to witness each moment of their growth. Probed further if they are keen to expand their family of four, Hannah did not reject the idea, though it will not be something they will be consciously aiming towards. With the recent closure of the couple’s Taiwanese dog cafe business, which was named after their pet dog Machi, Hannah explained that this was because the couple has plans to switch to a different business model, though they have yet to work out the details.